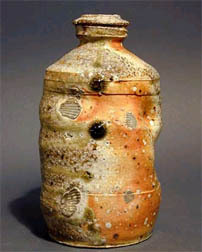 This course is a continuation of the work begun in AR 231, Introduction to Ceramics with more emphasis placed on finishing and firing techniques. Students are expected to have a more fluent command of the medium and should be working toward a portfolio of finished work that extends from an area of individual concern and purpose. In class demonstrations of technique will be balanced with occasional lectures on the history and aesthetics of clay work across the centuries and world. A field trip to the Yale Art Gallery to view examples of Egyptian, Minoan, Mycenaean, Greek, Etruscan and Roman Cultures will be scheduled early in the semester. Methods of decorating and firing clay work in the low temperature firing range. The use of underglazes, overglazes, slips and engobes and sgrafitto. -You will learn about clay and glaze composition and formulation. You will mix and test high fire glazes for use in class. -A primary emphasis will be on your following up on a specific method of creating ceramic forms, either wheel throwing or handbuilding. You will learn to increase the scale of your work all the while keeping control over the quality, coherence and contour of your work. Emphasis is placed on working in a series and matching individual objects in that series. -To appreciate how a unified, coherent form that is finely crafted is beautiful in its own right. To refine your control over the making process in order to work in series. -To further your understanding of how finishing and decorating contribute or detract from your intention as an artist. What role does firing method play in the meaning of the finished piece? Richards, M.C., Centering in Pottery, Poetry and Person, Miiddletown, CT, Wesleyan University Press, 1964. "Reconstructed Vessels and Functional Forms"